Mix your own inauguration-themed drinks this weekend. Whether you are spending Inauguration Day clinking glasses in celebration or in mourning, you’ll need a festive drink to sip. Here are The Hatchet’s signature drinks for Inauguration Day so your glass is never empty. Inauguration Day is a unique day to celebrate being American, and what better way to do that than with a red, white and blue cocktail? This drink takes a little extra preparation, but it’ll be worth it when you and your friends can pregame in style and even get a few festive Instagram photos out of it. 1. Fill one-third of a tall glass with cranberry juice. 2. Fill the rest of the glass with ice. 3. Pour the blue curacao liqueur over an upside down spoon and into the glass. Make sure you pour the liqueur very slowly so it sits on top of the cranberry juice, instead of mixing with it. 4. Combine plain vodka and seltzer water in a separate glass. 5. Rinse the spoon and repeat step three with the mixture of vodka and seltzer water. Add vodka and seltzer water until the glass is full. In this divisive election year, some people will be yelling out “impeachment,” even if you aren’t serving this cocktail at your pregame or party. By serving up this drink, you’ll get a few laughs out of your friends and make everyone forget about the headaches that came with this election. 1. Cut a peach into small cubes. Place the cubes in a bag and freeze them until solid. Once frozen, add a handful of the frozen peaches to a glass. 2. 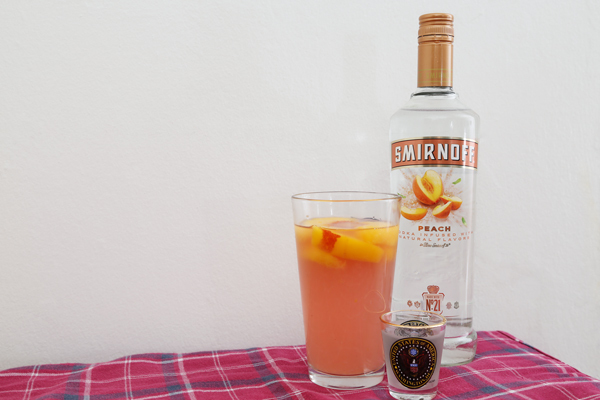 Pour 1.5 ounces, or one shot, of peach vodka into the glass. 3. Fill the rest of the glass with pink lemonade. Even some of the biggest Obama fans may not know that the president’s favorite drink is an ice cold beer. In fact, in 2012 the president enlisted his chefs to make two personalized brews, the White House Honey Ale and the White House Honey Porter, which were both made with honey harvested at the White House. After pleas from Americans who wanted to drink like the most powerful man in the country, the White House released a recipe for the ale on their website. If you don’t have the time or tools to make the president’s choice beverage, but still want to say goodbye to Obama in style, check out this recipe. 2. Add Corona until the glass is half full. 3. Fill the rest of the glass with lemonade. 4. Garnish with a slice of lime.